Neglect is the most common form of child abuse, but recognizing the signs, assessing the family's and the child's needs, and undertaking intervention can be difficult and complicated. This book, based on extensive research of the evidence, outlines how neglect can be recognized, examining the signs that parents give to signal their need for help, and the signs that a child's needs are not being met. It then covers how practitioners should respond, including assessment, planning, and appropriate interventions. The authors examine whether practitioners are well-equipped to recognize child neglect, and whether professional responses to help could be swifter. Finally, the prevention of child neglect is considered, and a proposal for a public health approach and early intervention is outlined. The book includes case studies and makes recommendations for policy and practice. 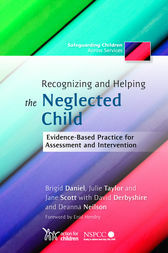 This book will help practitioners to understand better child neglect and to improve practice in this important area. It will be vital for all those likely to encounter child neglect, including child and family social workers, health visitors, teachers with safeguarding responsibilities, nursery staff, and educational psychologists. One of the biggest strengths to this text is how it sparks the imagination, motivating creativity of response to situations of neglect... I personally was left with the hope-filled message that "it is possible to prevent child neglect" (p.160)and the confidence to believe the necessary systemic change might actually be achievable. Brigid Daniel is Professor of Social Work at the University of Stirling, UK. She is the co-author of numerous books on child care and protection including Child Neglect, co-edited with Julie Taylor, and Child Development for Child Care and Protection Workers, 2nd edition, co-authored with Sally Wassell and Robbie Gilligan, both published by Jessica Kingsley Publishers. Julie Taylor is Head of Strategy and Development (Abuse in High Risk Families), NSPCC, and Professor at the University of Edinburgh, UK. She has written extensively on child care and protection. Jane Scott currently works freelance on several research and development projects, including the new Multi-Agency Resource Service (MARS) in Scotland, which aims to support practitioners and managers from all organisations working with vulnerable children and families. David Derbyshire is Head of Performance Improvement and Consultancy, Action for Children. Deanna Neilson is Group Manager Children's Services, Action for Children.